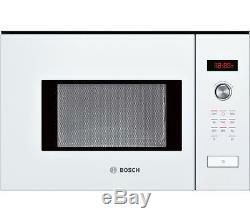 BOSCH Serie 6 HMT75M624B Built-in Solo Microwave - White. Brand new & pristine product. Heat food quickly and efficiently with the Bosch Serie 6 HMT75M624B Built-in Solo Microwave in white. Auto-cook settings The HMT75M624B features seven different pre-set automatic programs to help you cook every dish to perfection. With a capacity of 20 litres, there is plenty of room for you to heat and cook food of your choice. The microwave is easy and comfortable to operate, offering five different power levels between 90 - 800 W depending on your requirements. Frameless design Featuring a side-opening door, the HMT75M624B is convenient to open and designed to be built in a 60 cm wall cupboard or high cabinet. This allows it to effortlessly integrate into your kitchen. The microwave also gives you peace of mind by utilising an automatic safety switch-off, helping to keep you and your family safe while you enjoy the functionality it has to offer to a busy family kitchen. Enjoy efficient heating and cooking capabilities with the Bosch Serie 6 HMT75M624B Built-in Solo Microwave in white. All Currys/PC World Outlet guarantees are non-transferable. Maximum microwave power: 800 W. Auto cooking programs: 7 auto cook programs. Auto defrost programs: 4 auto defrost programs. Number of power levels: 5. Control panel: Push buttons & dial. Maximum countdown on timer: 60 minutes. Other features: Automatic safety switch-off, Interior lighting. Door hinge location: Hinged on left. Box contents: Bosch Serie 6 HMT75M624B Built-in Solo Microwave. External dimensions: 382 x 594 x 317 mm (H x W x D). Boxed dimensions: 440 x 380 x 660 mm (H x W x D). Boxed weight: 18.05 kg. This product has no reviews yet, however see what our buyers say about our other products.. Small box electricals like computers, tablets, camera's, small kitchen appliances. We deliver within the UK only. We don't post to Channel Islands or Internationally. Warehouse/store pick-ups are not available. For more information, read on.. Courier selection is standard and will depend upon value and/or weight/dimensions of the product. Your return can be tracked using the tracking reference from your proof of return receipt by clicking Track My Return. In the same condition as supplied to you - complete with any accessories and free gifts offered with it - if possible, with the original box and packaging. Reassuring 12 month guarantee on all products. The item "BOSCH Serie 6 HMT75M624B Built-in Solo Microwave White" is in sale since Monday, June 26, 2017. This item is in the category "Home, Furniture & DIY\Appliances\Small Kitchen Appliances\Microwaves". The seller is "currys_pcworld" and is located in Newark. This item can be shipped to United Kingdom.